(2) 14" long wire ties. Use for securing wiring to hub. Can be "daisy chained" for longer lengths. 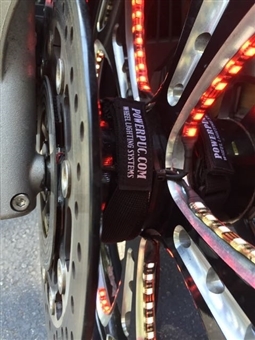 Gives a great finished look to your PowerPUC Wheel Lighting kit while maintaining easy access for service. Helps keep wires in place and covers your Backbone and wiring. 1" wide Stretch-Strap with Velcro closure is 22" long in relaxed state and stretches to 48" to fit any hub. Add a chrome finish to your G5 Power Block. Peel, stick and trim with a razor. Includes enough chrome tape for two (2) Power Blocks. (6) Six pacers required for rear sprocket mounting of PUC Ring on some Suzuki GSXR's and Yamaha R1's and R6's. Includes Double Stick Tape. does not include Velcro. This 8' cable has male-to-male quick connectors on both ends. Use to connect directly from Power Block to remote control box. The new G5 PowerPUC Backbone vastly improves the ease and time of installation. No longer do you need to wrap, cut, and solder multiple wires on your wheel hub. Use when upgrading from a G4 to G5 Power Block. Includes Includes G5 Power Block and pigtail with quick connect to replace G4 connectors. Makes removal of G5 block much simpler when removing for tire, brake, etc., service. Replacement slip-ring for G4 Power-PUC Wheel Lighting Kits. Size 1. Replacement slip-ring for G4 Power-PUC Wheel Lighting Kits. Size 2. Replacement slip-ring for G4 Power-PUC Wheel Lighting Kits. Size 3. Replacement slip-ring for G4 Power-PUC Wheel Lighting Kits. Size 4. Replacement slip-ring for G4 PowerPUC Wheel Lighting Kits. Size 5.